Republican and Democrat delegates were allocated throughout 11 states that held contests for the two parties as voting occurred throughout the day. 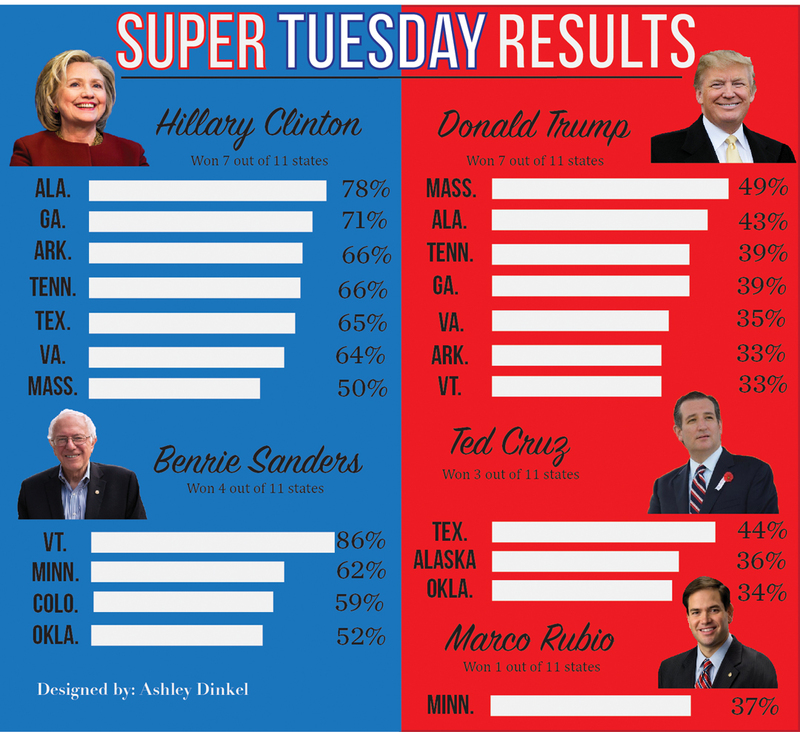 Unlike any other primary day, Super Tuesday has the most delegates grouped at once and allows for public clarity about who will likely be each party’s official nomination. Trump won seven out of the nine primaries, while Ted Cruz, GOP presidential candidate, won two primaries and the Republican presidential caucuses in Alaska. Trump congratulated Cruz’s win in the Texas primary during a press conference in Florida. Clinton beat Bernie Sanders, Democratic presidential candidate, with a 7-2 primary win while Sanders won two caucuses. Clinton thanked her supporters after the results came in during a rally in Florida. Marco Rubio, Republican candidate, won the delegates for the Republican Minnesota caucuses, while Sanders won the delegates for the Democratic Minnesota caucuses. In a rally Tuesday night, Rubio spoke to his share of supporters in Florida and assured the viewers he strives to bring back the American dream. Election season continues as Democrats and Republicans vote in the Louisiana primaries and Kansas caucuses March 5, and Republicans will vote in Kentucky and Maine along with Democrats voting in Nebraska.